Presentation of DTIC-UPF research in the context of the Maria de Maeztu Strategic Research Program on Knowledge Extraction. BDVA at the "ERTICO Proposal Development Workshop for H2020 2017 Calls"
ERTICO Office, Avenue Louise 326, 1050 Bruxelles. In April 2016, a series of surveys were opened to all ERTICO partners in order to express interest and ideas for the different 2017 H2020 calls. The answers were collected by the ERTICO office up to mid May 2016. During this period, ERTICO programme leaders organised a series of information webinars to encourage partners engagement. On the basis of the partners inputs, the programme leaders have identified possible approaches to the identified calls. They have interacted with the different partners who have expressed strong interest and innovative ideas. Whenever needed, the programme leaders have organised additional webinars dedicated to specific calls. The OI2 Forum will welcome innovation experts, policy-makers, people from Academia and citizens inthe vibrant city of Amsterdam, on 23rd and 24th May 2016! The OI2 Conference will be held under the label of the Dutch EU Presidency, and it is co-organised by the European Commission DG CONNECT's Open Innovation Group (OISPG) together with Intel Labs Europe, Committee of the Regions, CGI, Amsterdam University of Applied Sciences, City of Amsterdam, and kindly supported by Dublin City Council. The 2016 edition of the event is expected to gather more than 350 people around the following action oriented themes: Open Innovation 2.0 and Digital Single Market, ePlatforms, Data Driven Innovation, Urban Agenda, Future Cities, Living Labs and Business Challenges as cross-cutting themes, just to list a few, we have Power of Crowds; Experimentation and Prototyping; and Citizen Engagement in practise. BDVA will be well represented in several workshops and speeches. Big Data is about extracting valuable information from data to use it in intelligent ways such as to revolutionize decision-making in businesses, science and society. Big Data analytics is able to handle data volume (large data sets), velocity (data arriving at high frequency), variety (heterogeneous and unstructured data) and veracity (data uncertainty) – the so called four Vs of Big Data. Research on software analytics and mining software repositories has delivered promising results mainly focusing on data volume. However, novel opportunities may arise when leveraging the remaining three Vs of Big Data. Examples include using streaming data (velocity), such as monitoring data from services and things, and combining a broad range of heterogeneous data sources (variety) to take decisions about dynamic software adaptation. The Workshop is co-located with ACM International Conference on Computing Frontiers. The purpose of this workshop is to provide a fertile ground for collaboration between research institutions and industries and in analytics, machine learning, and high performance computing. Universiti Sains Malaysia and the CONNECT2SEA project are organising the EU-SEA Big Data Summit 2016, which will take place on 5-6 May 2016 at Hotel Bangi-Putrajaya, Malaysia. The aim of the Summit is to enhance the collaboration between European and South East Asia countries and set-up dialogues to discuss strategies, opportunities and challenges faced by the two regions in Big Data. There will be highlights of selected vertical markets that utilize Big Data in their applications. In the framework of this event there will also be a session with presentation of proposal ideas in view of the H2020 calls related to Big Data and "ICT39-2016-2017: International partnership building in low and middle income countries". The Summit is expected to foster collaboration on research and innovation among its participants via face to face networking activities, discussion and elaboration of potential commercial and R&D projects. This conference brings together scientific experts on Computer Science, Statistics and Economics as well as other professionals offering solutions to secure current data management from the perspective of Big Data, Data Mining and predictive classical Statistics. From these disciplines all stages of the Data Management process are addressed: data collection, integration, storage, pre-processing, analysis and visualization. As an integral part of the stakeholder consultation process in preparation of the publication of the European Space Strategy, the European Commission has initiated an action to ensure the fully-fledged development of the Copernicus Value Chain. The ultimate objective is of the workshop is to obtain a clearer view of the Copernicus ecosystem as well as to properly identify the barriers to entry and key enablers for market uptake so as to allow the Copernicus program to produce all the expected benefits. The workshop aims at identifying specific needs and expectations from the widest possible range of stakeholders and communities to foster the full development of the Copernicus Value Chain. It will gather a mix of representatives from the Copernicus ecosystem, actors from the information technology industry and big data domain, as well as existing and potential end-users of Copernicus data and information from a variety of industrial sectors. Two themes will be particularly addressed: data dissemination platforms for Copernicus and market uptake of Copernicus, including support to companies in the EO downstream sector. For more information and to register, please visit http://www.copernicus.eu/value-chain-workshop. efficiently process data sets using traditional technology is becoming more challenging as data sets take on varied properties such as volume, velocity, variety, variability and veracity. "Big Data" is the broad term given to address these emerging challenges. There is a broad agreement among industry, academic, and government stakeholders about the remarkable potential of Big Data to spark innovation, fuel commerce, and drive progress. Innovation in this space opens up a wealth of applications and ability to answer questions previously out of reach. While there is also broad agreement on the ability of Big Data to overwhelm traditional approaches, the ability to create consensus-based vendor-neutral, technology and infrastructure agnostic solutions to enable Big Data stakeholders is essential. The ISO/IEC JTC 1/WG 9 Working Group on Big Data would cordially invite Big Data experts to speak and participate in this International Workshop on Big Data Standards: European Initiatives. horizontal applications, databases, distributed resources and computing clusters. scale, timeliness, complexity, security, and privacy problems in Big Data that can create value. The Small Big Data Summit of the Big Data Value Association will take place in The Hague, The Netherlands on March 2nd and 3rd, 2016. The central theme of the Small Summit will be the Societal Impact of Big Data. Agenda and details of the venue will be communicated early 2016. The number of participants will be limited. The rapidly growing data economy presents an enormous opportunity for Europe to increase productivity and competitiveness. Public sector institutions alone could save more than €100 billion annually from increased use of data. Moreover, data-driven innovation will likely play a key role in addressing a wide array of the most important challenges facing Europe, from supporting an ageing population to improving domestic security to combating human trafficking. While the data revolution is poised to unlock enormous economic value, create new opportunities for scientific discovery, and improve quality of life for hundreds of millions of Europeans, these advancements will only be possible if Europe embraces policies to support innovation in the data economy. In some areas, such as public commitments to building smart cities and adoption of open data policies, European nations are in the vanguard. However, other areas need more work. Join the Center for Data Innovation at the inaugural event for its Brussels office where it will host a thoughtful discussion about the future of data policy in Europe, including opportunities to build and expand on successes to increase the use of data throughout the public and private sector. The event will be followed by a reception. The registration will close on 4th January 2016 (or earlier, if the maximum number of participants is reached). After the confirmed registration you will have the possibility to upload a presentation for the networking and partner finding sessions taking place on the second day of the event. You can also ask a specific question on the above mentioned calls for proposals which will be answered during the event and published together with the answer on the event website. Please note that bilateral meetings with EC Project Officers to discuss proposal ideas (proposal clinics) will *not* be possible, in compliance with H2020 rules. According to a recent study, 80% of CEOs think that data mining and analyses are strategically important to their company. Digitalization and the use of big data are essential to the development of precision farming, urban planning or water management. Digital services such as cloud computing, big data (including data-driven science and geo-spatial data) and thematic platforms are driving this transformation process. The latest generation of European satellites, from the Copernicus programme to ESA’s research programme , represent a unique asset for Europe in this challenge. They provide an unprecedented wealth of digital data, sometimes with unique features - free of charge. As an example, by way of modern apps technology, the world’s most accurate observations of the Earth gravity field by ESA’s GOCE satellite are used in each and every smartphone today. The rich network of Earth observation ground facilities in Europe coupled with EO exploitation platforms, dubbed “EO innovation Europe”, provides an innovation-friendly ecosystem through a series of open exploitation platforms coupled with business innovation centres. It would also naturally contribute to a European research and innovation cloud, bringing cutting-edge technologies to the market. It provides the basis for ‘Earth labs’ where critical parameters of our home planet are being continuously monitored to better understand the earth system, better predict and respond to climate change and sustainably use our natural resources. A special Information and Networking Day dedicated to H2020's ICT-15 'Big Data PPP: Large Scale Pilot actions in sectors best benefitting from data-driven innovation' (also known as Lighthouse Projects) will be organised by DG Connect - Data Value Chain Unit, on 1st December 2015 in Albert Borschette Congress Center in Brussels. Lighthouse projects are large scale Innovation Actions aiming to practically demonstrate how big data technologies can be transformative for data intensive industrial domains. Lighthouse projects are expected to deliver commercial and technological impact. Possible industrial domains of applications include (but are not limited to) health, energy, environment, earth observation, geospatial, transport, manufacturing, finance, media. BDVA will be present in the event Introducing the networking sessions: Industrial Challenges in PPP. How innovative are European businesses with big data? Key statistics on the demand side 2014 - 2020. Join the next European Data Market study webinar on The EU Data Market demand-side: types of data-based innovations and the way towards fostering data users presence. - Who are the data users in Europe? How many they are and where they are? - What are the different types of strategic uses of data sets and innovative technologies? - How can we strengthen data users’ preference in Europe? The webinar will take place next 26th November from 15:30pm to 16:30pm CET. The workshop will explore how Europe and European research initiatives, could support generic efforts to physical and mental health which are key to a productive and joyful life, as well as economic growth and prosperity. The workshop will gather high level international stakeholders. Discuss and identify opportunities and challenges of bringing together different research communities, public and governmental agencies, and enterprises and industries to successfully and efficiently acquire, analyse and exploit large longitudinal multi-national and multidimensional population based data sets. Match-making with appropriate e-infrastructure and service provisions supporting multidisciplinary research, and public and commercial stakeholder communities. Explore issues related to ethics, coordination, standardization, resource allocation, education and training and safeguarding private, public and commercial interests and intellectual property. Identify required human and physical resources, and discuss the optimizing of existing and the development of new and innovative data acquisition, registration, quality, management, privacy and safety, sharing, integration, mining and exploitation infrastructures, technologies and strategies. 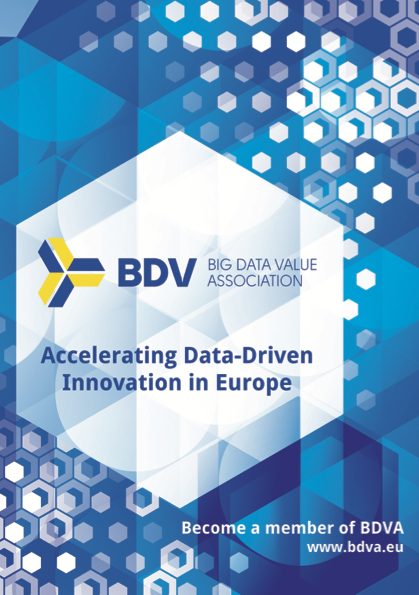 "This presentation will describe the objectives and activities of the Big Data Value Association, a fully self-financed non-for-profit organization acting as an industry-led contractual counterpart to the European Commission for the implementation of the Big Data Value PPP (Public-Private-Partnership). Basic principles of BDVA are openness, transparency and inclusiveness. We present the organizational structure of BDVA and describe the current and scheduled activities, particularly the Strategic and Research Agenda (SRIA), which defines the overall goals, main technical and non-technical priorities and the roadmap for the European cPPP on Big Data Value"
This is a public workshop with an opportunity to learn about and to influence the update and consolidation of the current Big Data Value strategic research agenda (SRIA). In the context of the SRIA Update Process, the BDVA SRIA Update workshop in Luxembourg on November 18th is organised in order to consolidate the work and results of the ongoing survey and input gathering process that is relevant for the SRIA update. 7. Overview of SRIA Non-Technical Topics, N.N. Please find also the file describing the details of the SRIA update process.